Transparency International (TI) Anti-corruption Organization proposes to start investigation against Karin Strenz who is accused of accepting bribes from Azerbaijan. The organization also requested to suspend parliamentaryimmunity of Strenz from the German government. According to the member of TI Department, Wolfgang Wodarg, the results of CoE investigation give enough reasons for reasonable suspicion of Strenz being corrupted, reports Deutsche Welle. Transparency International hinted on the scandal in PACE in 2017, when European Stability Initiative was conducting its investigation in Azerbaijan’s lobbyism activities. In the final document titled “Caviar Policy” the organization presented proofs that Baku bribed the members of PACE Monitoring Committee. As a result, own independent investigation body- IBAC was formed in PACE, which discovered that PACE MPs confirmed that Azerbaijan attempted to win loyalty of the organization in exchange of many presents from the country including black caviar, rugs, expensive alcohol and jewellery. Dozens of PACE members’ names were included in the IBAC report published in April 2018. One of them was Bundestag MP Eduard Lintner who was a member of CoE in 1999-2010 and who is considered a key lobbyistof Azerbaijan. According to IBAC, Lintner was the one who involved Karin Strenz in the lobbyism activities for Azerbaijan. They both are forbidden to enter Strasburg-based PACE. Strenz claims that she was not aware that Lintner’s Line M-Trade consulting firm was financed by Azerbaijan. However investigators had more questions for her regarding Azerbaijan i.e. why Strenz renamed the ownership of her new Karin Strenz GbR company to her husband’s name, whether the new owner received funds from Baku and if yes, for what services. Strenz, when being an observer during the elections in Azerbaijan in 2015 did not show her commercial interests in that country. According to some sources, on the day of elections she did not even visit any election point in Baku instead she spent the entire day in Aliev’s residence. Berlin prosecutor's office investigated Strenz’s past however the suspicions were not seemed convincing enough to start an investigation. The case has been discontinued. 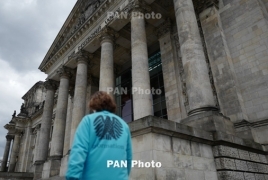 Strenz’s case progresses slowly in Bundestag. One of the reasons may be the fact that Strenz illegal actions, for which she is prohibited to enter PACE, took place when she was CoE MP and not yet Bundestag. However she remained a German MP and was obligated to show her external earnings and their origin, and this cannot remain without consequences, writes the source.